Today, we’ll take a look at how to create an electrical pulsing text reveal in After Effects using mostly built-in effects. The technique is fairly simple and with minor effort, you can create some awesome transitions for your logos, type, or graphics. Since the effects are masks driven, you have full manual control over the paths of the electricity and everything can be shaped by you. As an optional effect, I used my Dojo Glitch v2 script which you can get for free on the site. In this tutorial, we opted to use the built-in Stroke effect as opposed to using Trapcode 3D Stroke, but if you have the plugin, I’d suggest you use it for the taper controls and extra settings. The results will be very similar, but I find Trapcode 3D Stroke to yield slightly better results. Plus with Trapcode 3D Stroke, you get integrated 3D that will react with your camera, as opposed to faking it with the 2D Stroke effect. Since we’re converting our text layers to masks, the whole text isn’t quite ‘procedural’ as we’d like it to be, although the whole effect does stay intact. I didn’t explain it in the video, but you can replace the text without redoing the whole animation by creating new masks of your new text using the same “Convert Text to Mask” command. Delete all the old masks from all the solids, then paste your new text’s masks onto all the solids and you’ll find that all the animation is still procedural. That is because we’re applying all the effects to the solids, so changing the masks within the solids doesn’t break our animation at all. Overall, the technique used to achieve this electrical text is very simple. If you want to get fancy, you can actually play around with the mask paths to get interesting electrical movements around your logo or text. If you guys have any questions or comments, feel free to let me know in the comments section below. Really great tutorial, however I think I discovered a bug on the Glitch script. The Glitch script install the pseudo effect every time I open the script. I think I get a new copy of the XML file every time i run it. Thanks! Dojo Glitch actually checks if the XML is properly modified BEFORE installing the code. If you already opened Dojo Glitch and installed the pseudo effect, Dojo Glitch will not re-do it unless it sees it’s not installed. Does getting a new copy of the XML file effect your workflow in anyway? It’s suppose to just update it with exact contents, not remove anything. Thanks for your feedback! That is a great tutorial. I’m an Ae user of at least 5 years and I learned a thing or two here. I’d love to give this a go on a logo. This is amazing!! I’m very inspired. Question: how would I do the same stroke/electricity pulse over the entire grid? Thanks! And that’s a very good question, I see no easy way of doing this via the “Grid” effect. I would manually create the grid using masks (make a small section and just duplicate to expand grid), then use the same techniques on it. how to get glitch script for free? Set the price to $0 in the price field. Hi, tutorial is great, and it works very good with the fonts. I wonder how to do it, if one has an outline from illustrator, or just normal mask. This tutorial really helped me and I hope you make more in the near future! Do you think It’d be possible to do the same sort of effect on things other than text? Just curious. Thanks! Yes, this effect will work on anything that uses After Effects masks, so logos, paths from Illustrator, etc will work just fine. Dude, You are amazing, thanks for the tutorial. Well done and inspiring tutorial. Thanks for the scripts! Where can I grab the sound you used? It’s actually a mixture of sounds, combined together to get the desired results. Most of it is from Video Copilot’s Motion Pulse. I’m really new to After Effects, so bear with me. I put the Stroke effect on the text outlines solid and duplicated every setting you have, but when I move the Start slider I see nothing. Delete the text solid once you paste the masks onto the electric effects. The effect relies on masks, so once you have them and use, you don’t need the source layer anymore. The glitch scrpit doesn’t work. Even as administrator and i reinstalled the version of CC that’s 13.1 – should work right ? Yes, AE 13.1 should work for Dojo Glitch just fine. What doesn’t work exactly? Awesome tutorial bro!! This opened my eyes into the world of After Effects, and you were the Conduit. Where did you get that electric sound effect? Mixture of personal sound library and Video Copilot’s SoundPulse collection. does it work in AE cs5? 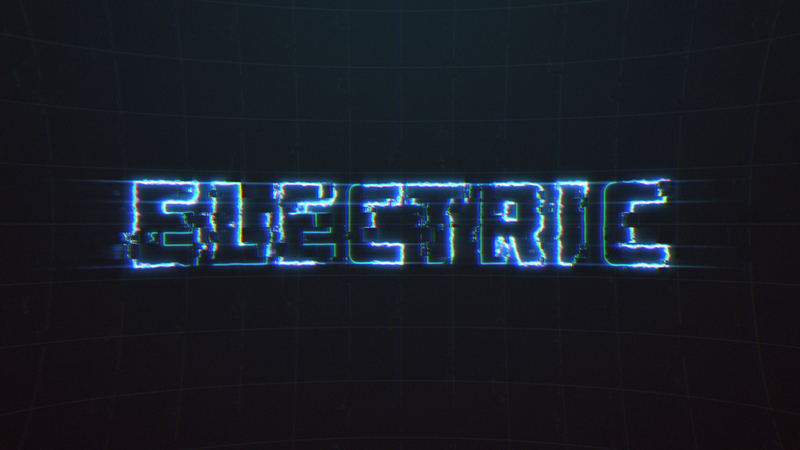 First of all i would like to thank you for tutorial, i’ve made the same thing like yours, no error, just a smooth tutorial with a cool look, i just want to ask one thing i.e i’ve written “Electric” text, can i change this text? without starting whole thing from scratch?